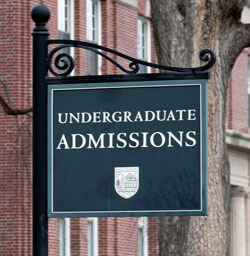 According to findings from a new Pew Research Center survey, 73 percent of Americans say colleges and universities should not consider race or ethnicity when making student admissions decisions. Seven percent say race should be a significant factor in college admissions decisions, whereas 19 percent say it should be a minor factor. More specifically, 78 percent of White adults agree that race should not be a factor in college admissions, whereas 65 percent of Hispanics, 62 percent of Blacks and 59 percent of Asians hold this view. This subject reemerged early February when a federal judge heard closing arguments in the lawsuit against Harvard University that could potentially go to the U.S. Supreme Court and affect the future of affirmative action in higher education, according to a Pew Research release. When survey respondents were asked about admissions criteria that colleges may consider, a student’s high school grades was at the top of the list. Sixty-seven percent of Americans said this should be a significant factor in admissions, whereas 6 percent say it should be a minor factor. Opinions stated in the survey vary by education, with those who have at least a bachelor’s degree more likely than those with less education to say a student’s race and ethnicity should be at least a minor factor in college admissions.